MIKU!. . Wallpaper and background images in the Learning Japanese club tagged: japan anime. This Learning Japanese photo contains 애니메이션, 만화, and 만화책. I bet it fires leeks! 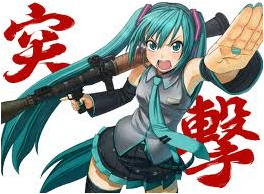 love the pic of MIKU,but wat does this have to do with learning japanese,I WANNA LEARN JAPANESE!!!!!!! !